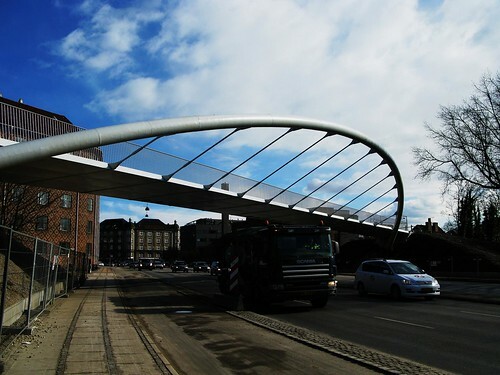 This new bicycle and pedestrian bridge opens shortly. It stretches over one of the main roads into the city, Åboulevarden. It is part of the new "Green Path" bike lane/walkway that traverses the city and acts as a kind of "bike motorway" for those who just need to get from one end to the other as quick as possible. We posted about it earlier. Architects Dissing & Weitling designed it and the 8 sections were hoisted into place over the easter weekend, after being manufactured in Poland. The design is meant to symbolise a grand entrance to the city. I love that irony. 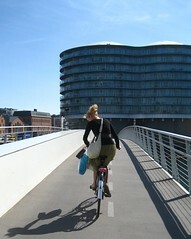 That cars zipping along underneath are welcomed to the city on this route by a splendid bicycle and pedestrian bridge. It's a wonderful project and this bridge is the piéce de la resistance. In the photo above you can see the bike lane that runs parallel to the motorised traffic, separated by a kerb from the three lanes of traffic. 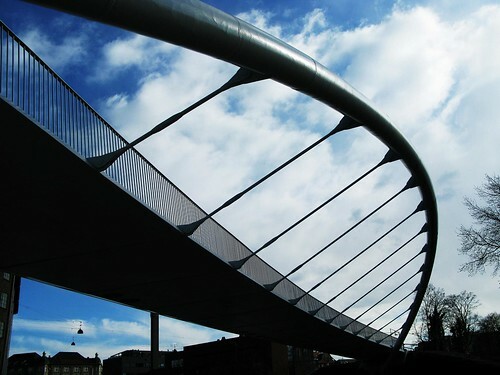 It's the second in a long line of cycle bridge projects. The first was over the harbour and there are at least two others starting construction soon.